If you’ve decided to learn how to drive under the guidance of a fully qualified driving instructor, your tuition will normally follow one of two patterns. Either you’ll book and take your driving lessons at regular intervals, for example a lesson a week or you’ll decided to learn and subsequently take your test in the shortest possible period of time. If the thought of 40 one hour driving lessons spread out over the course of a few months is something you are not interested in, you may be suited better by a semi-intensive driving course. A semi-intensive driving course is a type of intensive driving course that takes place over 2 – 3 weeks instead of the standard week long intensive driving course. Learner drivers practice for between 2 – 3 hours per day and lessons are normally taken in quick succession, but not necessarily on consecutive days as you would expect on a traditional intensive driving course. Why Would You Take a Semi-Intensive Driving Course? Everyone learns to drive at their own pace and some individuals learn better when their lessons are closer together, while others need a break between each lesson to absorb and process all they have learnt. Semi-intensive driving courses are increasing in popularity and there are several reasons why an individual may decide to book one. If you’re close to test standard, a semi-intensive driving course is fantastic at ensuring you are well prepared to take your test. A few intensive driving lessons right before your test date will help you iron out any lingering issues and improve your confidence just before the big day. You will always have a better chance of passing your driving test if you’ve been practicing right up until the day of your exam and this is a popular reason why people decide on booking this course. 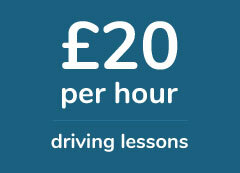 Individuals who have had some previous driving experience often benefit the most from a semi-intensive driving course. Once you’ve reached a reasonable standard of driving, dedicating 2 hours a day, 2 or 3 times a week to driving really allows you to work on the areas you struggle with and you’ll often make progress at a much quicker rate this way. If you have mastered the basics before starting this course, you can devote the entirety of your lessons to improving your standard of driving and not getting to grips with the car. Traditional intensive driving courses require you to practice for up 6 hours per day on consecutive days, while a semi-intensive driving course allows you to space your driving lessons out according to your schedule. This added flexibility ensures that learner drivers are less likely to be stressed or burnt out by the time they reach their test date. Unfortunately not everyone in life is blessed with a great memory. Often you’ll come across learner drivers who struggle to remember the concepts they were taught in their previous lesson. In such situations a semi-intensive driving course is fantastic at allowing students to build on what they were taught in good time, which reduces the chances of the learner forgetting concepts they have preciously worked on. The length of the course varies depending on the needs of the student. For individuals who are already close to test standard, they may choose to book a shorter course, for example one lasting 10 hours and they would typically use these lessons to iron out some of the remaining issue they have. While a learner driver with no previous experience may choose to book a longer course, for example one lasting 30 hours to allow the to get to grips with the car. Our number one tip for anyone considering booking a semi-intensive driving course is to make sure you book an assessment lesson with the prospective driving school or instructor before committing to a block booking. A semi-intensive driving course is not cheap and as you will be spending a lot of time with your potential instructor over the duration of your course, it’s important that you get on with your tutor and your’re happy with their teaching style. Also it’s important to have already booked and passed your theory test as you’ll need to have passed this before being allowed to take your full practical driving test. Each individual learns to drive at their own pace and for learner drivers who want to accelerate their progress, without putting too much pressure on themselves, a semi-intensive driving course is often the perfect way of doing so. If you require more information on courses of this nature, fill in the short contact form below and one of our friendly team will get back to you shortly.